The Institute of Fluid Mechanics at the Technische Universität Braunschweig performs a wide range of applications in computational fluid dynamics. This includes flows in turbomachinery around aircraft and cars, as well as applications in hypersonic flows. In each of these areas, students are involved in the scientific research process. In our longstanding expertise in simulating flows, we found the best tool for generating grids to get suitable computational results is Pointwise's Gridgen. One example of a demanding application in which high grid quality is critical for obtaining accurate results is the simulation of an unsteady moving wing. The flight of birds in general and flapping wing propulsion in particular have been the subject of research for decades. During the last 10 years, our institute has discovered important contributions to the analysis of generating propulsion with moving, two-dimensional airfoils. With this background in place, the time came to investigate the flow phenomena of a whole, three-dimensional wing in motion. Our aims were to simulate the three-dimensional motion of a bird wing, including varying pitch angles and displacements along the span and to analyze the forces acting on various sections along the wing span. The performance of the wing, especially in some predefined sections, was investigated by varying the wing motion. Therefore, we needed meshes of very high quality to resolve all the important effects. 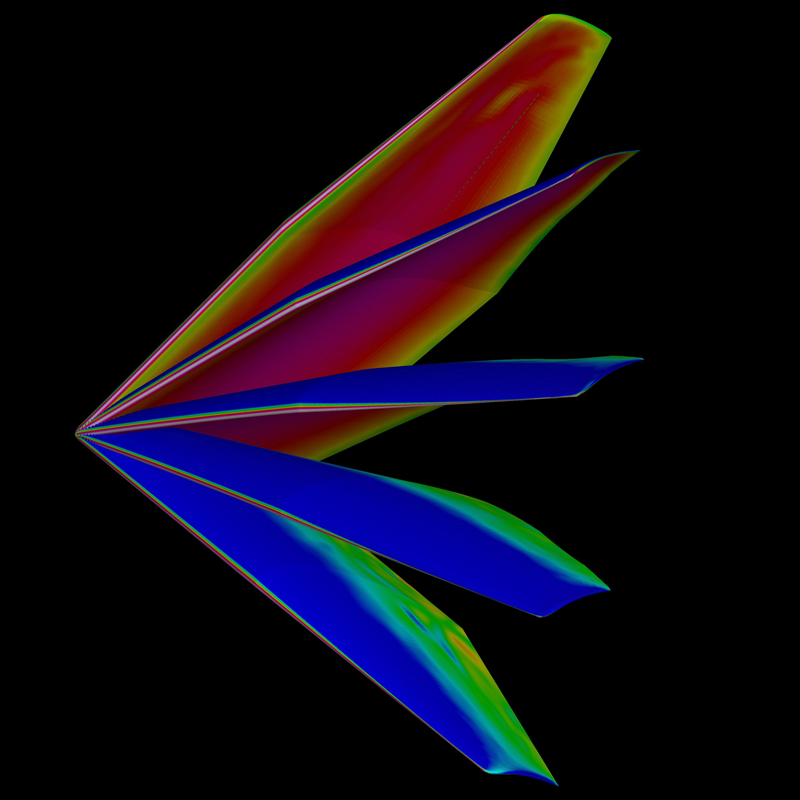 As a starting point, we created a mesh of a bird-like wing in a neutral position using Gridgen, and then ran simulations by twisting and flapping the wing. To accomplish this motion, we used the basis mesh and deformed the surface and volume cells in each time step so that a flapping motion could be simulated. In this manner, the wing moves identically to the wing of a bird. To simulate this motion and the resulting flow around the wing, we used a hybrid grid. This consists of a structured surface mesh and a structured volume mesh around the wing geometry. This was done in order to properly resolve the boundary layer and the motion induced vortex system near the surface. The farfield grid was built with three layers of anisotropic cells around the structured block and was then filled with pyramids and tetrahedra. With this grid, we performed several unsteady simulations of a flexible moving wing, as can be seen in Figure 1. The movement of the wing was defined with a mesh deformation module using radial basis functions. Every point of the surface mesh was moved with respect to a predefined function, depending on the position of the actual point along the wing span. The wing tip showed maximum deflection, while the wing root remained fixed. The points of the volume mesh were shifted with respect to their distance to the surface mesh, so that points closer to the wing had more displacement whereas those farther away moved less. Thereby, the farfield, and especially the farfield boundary, remained mostly unaffected by the deformation. Moving the grid points changed the cells' shapes. Therefore, the basis grid which is deformed in every time step had to begin with a very good cell quality. Figure 1 shows a down stroke of the bird-like wing using mesh deformation. The surface is colored with contours of pressure coefficient for each time and motion step. The results of this computational analysis were presented as a conference contribution. Using Gridgen for the basis grids in this study enabled to us to create high-quality grids needed to meet our quality criteria, even after deforming cells to capture the wing motion. Figure 1: Down stroke of the wing in five steps using mesh deformation with contour of dimensionless pressure on the wing surface.